An overview of three indispensable Essiac information guides, written by Sheila Snow, Mali Khan and Gary Glum. 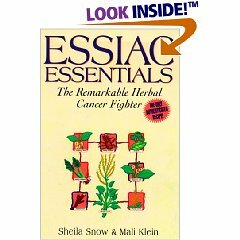 Essiac Essentials - The Remarkable Herbal Cancer Fighter by Sheila Snow and Mali Khan, 1999. If you want to make your own Essiac Tea using a reliable formula, then a good starting point is to follow the Essiac Essentials by Sheila Snow and Mali Khan. There are two versions of this book. One is American and other is published in the UK. Except for the cover (US version is yellow and UK version is green), they are identical. According to the authors, this Essiac information guide has the only authenticated herbal recipe for Essiac. It includes detailed instructions on where to buy Essiac, the most effective way to brew it, and how to easily grow and harvest it at home! Now you are going to ask: Who exactly are Sheila Snow and Mali Khan? Sheila Snow lives in Ontario, Canada. She interviewed Rene Caisse and knew her personally. She was also a close friend of Mary Mcpherson, Rene's close friend and helper for more than forty years, and Dr. Charles Brusch, her long term partner and co-developer. Mali Khan is from Hampshire in the UK and founded The Clouds Trust charity to research Essiac after her husband passed away from cancer in 1994. The authors spent considerable time doing research in Bracebridge, Ontario, where the Rene Caisse Cancer Clinic was located, and they had access to Canadian archives of unpublished Rene Caisse documents containing valuable Essiac information. According to many sources, this book gives highly reliable information about Rene Caisse's original recipe. It has been verified by Mary McPherson, Rene's close friend and helper for more than forty years, in her sworn affidavit dated 23 December 1994 in Bracebridge, Ontario, Canada. Essiac Essential is out of print but can be purchased second hand from Amazon.com. It has only 122 pages, but due to its rare availability, the price has now risen to at least $99.95! Alternatively, if you want to save money and wouldn't mind purchasing the UK version for less than $15 (excluding shipping), get in touch with Clouds Trust. 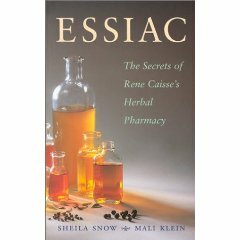 Essiac: The Secrets of Rene Caisse's Herbal Pharmacy by Sheila Snow and Mali Khan, 2001. Another indispensable guide book from Sheila Snow and Mali Khan, the Essiac Secrets reveals what they have discovered of other formulae or herbs Rene Caisse may have used. They also share the information they have found in archives about the roles played by some of the more prominent figures involved with the development of Essiac, especially during the last years of Rene Caisse's life. In addition, they have included information related to the basic science of cancer, the related chemical and radiation therapies, and the importance of maintaining a healthy diet and lifestyle in order to enhance the possibly palliative and remedial effects of the Essiac formula. The book concludes with selected case histories and a list of international resources related to Essiac. Essiac Secrets is out of print but can be purchased second hand from Amazon.com at a reasonable price. 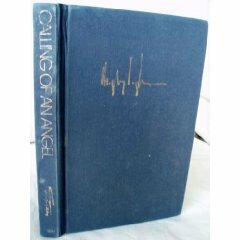 Calling of An Angel - The True Story of Rene Caisse and an Indian Herbal Medicine called Essiac by Dr. Gary Glum, 1988. This book tells the incredible story of Rene Caisse and her lifetime battle to bring forth Essiac, and reveals for the first time publicly how to acquire the formula to brew Essiac in your own home. The story of Dr. Gary Glum himself is pretty amazing. According to reliable sources, Rene Caisse's close friend and helper for more than forty years, Mary Mcpherson, was the only person entrusted by Rene with the formula. However, Mary had made a deathbed promise to Rene never to reveal the formula to anyone. Were it not for Dr. Gary Glum revealing the formula, we would not have it today. Gary purchased the formula for $120,000 from one of Rene's former patients. He later gave out the formula and recipe free of charge. Later, Mary swore an affidavit on 23 December 1994 in Bracebridge, Ontario, Canada. The formula she gave out was identical to Gary's. Every year medical science spends billions of dollars in a desperate search for the cure for cancer. And yet, despite the use of increasingly expensive and dangerous technology and drugs, we never seem to get any closer to sparing mankind from our most dreaded and deadly disease. Is it possible that the answer to our prayers about treating cancer has been available to us all along, a gift from nature, hidden in the life-giving properties of certain plants that grow wild all over North America? The answer is yes. For more than 50 years, Rene Caisse, a nurse in Canada, successfully treated thousands of cancer patients with a simple herbal formula that was discovered and first used long ago by the Indians. Rene Caisse brewed the herbs into a tea that she called Essiac, and many of her patients and their families and friends swore that Essiac's healing - and pain-relief - powers were nothing short of miraculous. Distinguished physicians - from the 1930s until the 1980s - have spoken out in favour of Essiac's value as a cancer treatment. Yet Rene Caisse's use of a natural treatment for cancer made her a controversial figure in Canada. In the midst of a national political debate, fuelled by newspaper headlines, the Canadian parliament in 1939 came within three votes of legalizing her use of Essiac. For years after that narrow defeat, under the constant threat of arrest and jail, Rene Caisse continued to treat patients and win their passionate support. She never charged a fee for her service. She accepted only voluntary contributions. Her goal was to help people, not make money, and the cancer patients fortunate enough to come under her care came to think of her as an angel.